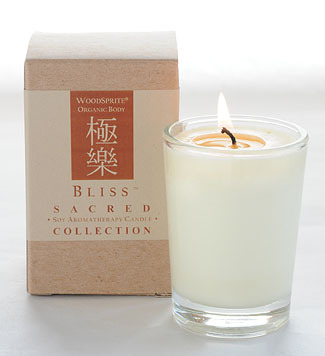 Make Every Day Sacred--Let your spirit take flight with our vivid blend of frankincense, coriander, bergamot and other sacred essential oils in a 100% natural, clean-burning, dye-free soy aromatherapy candle. Hand-poured in a refillable glass. Presenting the Sacred Collection -- specialty blends of ancient, precious essential oils and resins long revered for their unique healing properties. These are the sacred oils; valued and traded as currency, honored in spiritual ceremonies, journeying across many cultures, continents and centuries. These timeless oils continue to assist us in healing and in finding our spiritual path. May their heart and depth resonate within you as you make your own journey. Pure Essential Oils of: Bergamot, *Organic Sweet Orange, Tangerine, Frankincense, Coriander, Tagette, Cardamom, Allspice, Myrrh & Clove. (*Certified Organic) 3.5 oz. wt. Hand-poured candle in refillable glass. Approx. 25-hour burn. Earn 18 Loyalty Points when you buy this item!